Whether you’re a direct Torrent user or a user of a service that streams directly from the Torrent networks you need to secure your privacy. The best way to do this is by using a VPN. It stops inquisitive types from snooping on what you’re downloading or monitoring what you’re watching. However, choosing a VPN for torrenting is difficult because they’re not all the same. Some don’t allow torrenting at all and others restrict it to specific servers. So, which is the best VPN for Torrenting? That’s what we’ve been discovering and below we’ve rounded up the Top 5 choices of VPN services great for torrenting. The one that stood out the most is NordVPN but any of these 5 will be suitable for keeping your torrenting use private and secure. Before you go diving in head first and just choose any random VPN it’s important to consider a few factors. Allows torrenting: It may sound obvious to say but check to see that the VPN service allows Torrenting, some don’t. Some indicate it’s acceptable while others will have dedicated Torrent or P2P servers. Others will specifically mention phrases such as “Anonymous torrenting” or “Unlimited P2P traffic” so be sure to look out for those. Fast download speeds: If you’re a big user of torrents or services that stream from them directly then you’ll need to ensure good speeds. If the VPN affects your speeds too greatly then you’ll get buffering issues or your downloads can take a lot longer. Stick to tried and tested services, in our reviews we monitor download speeds so it’s worth checking them out. Local servers: As a VPN user you’ll want to connect to more ‘torrent-friendly’ countries. Ensuring there are enough nearby locations allows you to get the privacy of the VPN while not hugely impacting your speeds. Money back guarantee: Any good VPN should offer a lengthy money back guarantee. These can range anywhere from 7 days up to 45 days. Making sure you test the service thoroughly for your usage in that period will ensure you get the best out of the service in the long run. Above are some of the most important factors you should consider when choosing a VPN. Now let’s take a look at the Top 5 services who honour those and will give you the best experience as a torrent user or streamer. NordVPN has become one of the leading VPN services. In fact, we recently scored them 4.6 / 5 in our latest NordVPN review for the overall quality of their service. Torrent users are especially well catered for as the service has dedicated P2P servers that stretch across the globe. Specific torrent-friendly servers cover North & South America, Europe, Africa, Asia and the Australia regions. One of the standout features of the service is the minor speed loss when connected. Even using a high-level of encryption we only lost a few Mbps compared to our standard connection speed which is great when downloading large files or streaming without interruptions. At the end of 2018, NordVPN released an audit of their service to show their no-log claims were sound. There are very few other VPN services that have gone to such lengths and as such where keeping your privacy is concerned this makes a sound investment. The service offers apps for all major devices and comes with a 30-day money back guarantee allowing you to test it risk-free. ExpressVPN made our Editor’s Choice pick for this year for their overall service and they’ve got a good offering specifically for Torrent users too. There are no dedicated servers for Torrenting which means you can make use of their extensive network that spans 94 countries. However, they do claim you can “Access any content” and there are “No restrictions” on what you do while connected to their service. The service claims to store no-logs of your activity or connection data and this was tested in 2017 in a high-profile criminal case (you can read about that here) which goes to great lengths to show their claims are honest. There are more dedicated apps than most services offer including for Windows, Mac OS, Linux, Android, Apple iOS, Amazon Fire TV, a selection of routers and more. They also have a range of browser extensions available. So whatever your torrent device of choice you’re likely to be covered. The service has a 30-day money back guarantee to give you plenty of time to test it with your regular Torrent haunts. IPVanish is another service friendly to Torrent users. In fact, so much so that they even specify the service allows “Unlimited P2P traffic” and the ability to “Torrent anonymously”. There are no specific P2P servers on the service which means you’re free to use any across their network of 60 countries. Speeds on the service are favourable and in our most recent tests, we found them to offer only a minor speed loss when downloading. The service allows you to use it on up to 10 devices at the same time which means you can torrent/stream on some devices while still protecting the privacy of others all from the one account. If you’ve got a large family with many devices then you’ll appreciate this cost-saving feature. The service claims to store no logs of your activity and while this hasn’t been proven with an audit like other providers, the new owners of the service recommitted themselves to this policy only last year. One drawback is IPVanish has one of the shortest money back guarantees at just 7-days. So you’ll need to ensure you’re ready to test them thoroughly in that week to check they’re suitable for your use. CyberGhost VPN offer up an alternative VPN service for Torrenting and they have dedicated servers. Use any of the services well-designed apps and you’ll have a special section dedicated to “For Torrenting”. While there are plenty of servers located across Europe from the UK through to Moldova there are unfortunately not many offerings elsewhere. If you’re a user in the US then you can connect to Canada but outside of there, the European locations and Japan there are no other locations available. If you’re from elsewhere in the world you may need to consider the distances between their nearest server and your location. As an added bonus CyberGhost VPN has a huge 45-day money back guarantee which is more than almost any other service. So even though they have a lack of worldwide Torrent servers you do have plenty of time to test it. VPN.ac is a lesser-known VPN service which means you could have the servers practically to yourself. They have specific P2P servers which are located in Canada and across Europe. If you’re elsewhere in the world then you’ll need to stick with one of the earlier services that provide Torrent-friendly servers nearer to your location. If you’re near Canada or in Europe then you’ll be rewarded with some of the fastest speeds available. VPN.ac don’t oversell their service and there’s plenty of bandwidth to go around. Their Torrent-friendly servers are even called “P2P Optimised” which means, in theory, you should get the best available download experience when using them. Although paying on a monthly basis is a little expensive the price is extremely competitive when taking their annual package. So if you’re looking to protect your torrent habits all year round then you could make a big saving in the process. Apps are available for all major devices plus there’s a 7-day money back guarantee allowing you to test the service. Which Torrent VPN is best for you? Choosing the Best VPN for Torrenting is mostly about what’s best for your personal circumstances than anything else. While a local server to us can be very good, if you’re on the other side of the world and the service has no nearby servers then it negates any benefit. So to help you make an actual choice based on your preferences we’ve broken it down into typical usage scenarios. If you want a high level of encryption and privacy protection, choose NordVPN. They use one of the strongest levels of encryption, store no logs of your activity and are located off-shore in a jurisdiction friendly to P2P activity. If you want overall security and privacy you can’t go wrong here. If you want a fast network of servers, get ExpressVPN. In our most recent review of their service, we found only a limited impact on the speed of their service making them one of the fastest in the industry. If you want a guaranteed no-log policy, take NordVPN. They’re one of few VPN services that have had their no-log policy audited. It’s about as good as you’re going to get if you need ‘proof’ of no-log claims. If you want to try without risk, get CyberGhost VPN. Their 45-day money back guarantee is unbeaten. This allows you to test the service for a huge amount of time without any risk. If you don’t like their service then get yourself a refund. If you want a P2P-friendly service, sign up for IPVanish. They’re one of few services which specifically state they allow “Anonymous torrenting” and “Unlimited P2P traffic”. If you want a none-mainstream service, get VPN.ac. They have specific servers for P2P and torrenting and are lesser known which means their servers are less utilised giving you greater speeds. Torrenting and P2P use have continued to get a bad rap over the last decade and while it’s no secret that it can be used to download and stream illegal content there is a wealth of legitimate uses too. Simply by using Torrents will lead to raised eye-brows and assumptions about your usage. Keeping your privacy safe when using Torrents is therefore essential. Unblocking extra sources of content. Stopping prying-eyes from monitoring your downloads. Avoiding bad internet routes causing slow speeds and buffering. Unblocking Torrent services on networks where they’re blocked. If you’re using Torrents or services and apps that make use of P2P networks either infrequently or regularly then you really need to ensure you’re using a VPN. With so many VPN services available it can be incredibly difficult to choose just one. 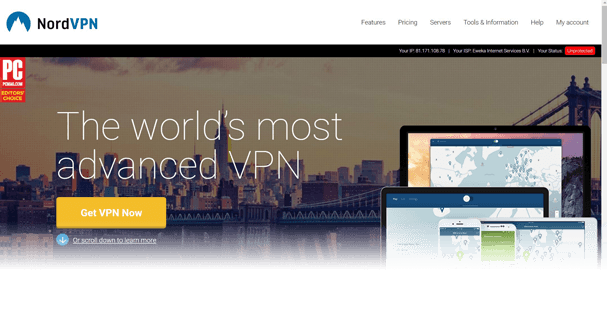 The service that stands out this year is NordVPN. They’ve got a proven no-log policy, they’re registered off-shore, they’re torrent-friendly and their download speeds are some of the best we’ve monitored this year. However, above we’ve listed the top 5 choices so you really could choose any and get an excellent experience. So whether you’re a direct Torrent user or a streamer that uses services which rely on torrent networks, make sure you’re using one of the five providers above for a much improved and safer experience. What VPN have you been using for Torrenting? Let us know in the comments section below as we would love to hear your thoughts.